This is a beach just south of Daytona Beach that is called the shark bite capital of Florida. The beach area is usually not very busy. This is the beach called Bethune Beach in New Smyrna Beach. 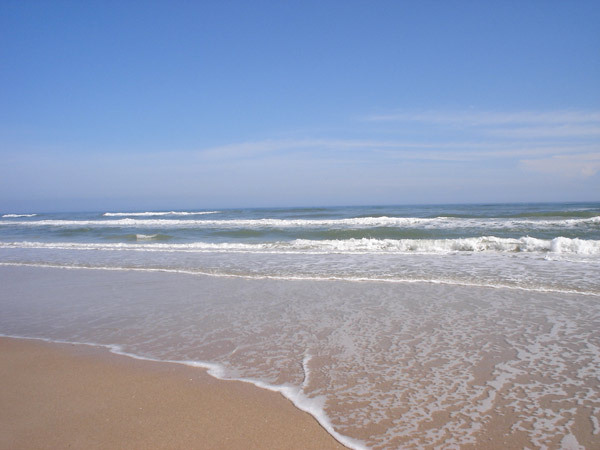 Most of the beaches on the East Coast of Florida are flat, and the sand is more compact. The Gulf Coast beaches have better sand, sunsets, and more variety. These beaches are good for retired people. The sharks are very hungry in this area – known as the shark bite capital of Florida. New Smyrna has the highest shark bite reports in Florda. There is not a whole lot to see and do at this beach, which may be a draw for people who want to experience the beach without all of the standard tourist shops and restaurants. Surf and sand in Florida. There are restaurants near this beach, but not with a direct window view of the beach. Just North of this beach is the Daytona Beach, which has more tourist shops and on-the-beach restaurants.